How weird is this episode's title? Seriously, who has ever been Marcused? After their short, meaningless talk last week, we find Dan and Serena just waking up on the beach after they had their straight-out-of-a-romance-novel scene. Serena woke up all confused, which got Dan confused, and rendered me confused as well. Don’t tell me Serena is suddenly having second thoughts after finally being with the one person she has been pathetically pining after all summer. Oh, wait. She is. They talk, kiss, and agree that they need to actually think (uh, duh) before officially getting back together, and then they part ways. Meanwhile, Blair and her Lord Marcus seem to be having a good time together. Blair is hoping for a more royal future, but Marcus seems to be evading Blair’s introduction to his family. This prompts Blair to excuse herself and call Serena for an immediate best friend therapy. 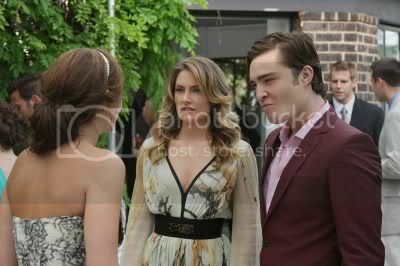 Chuck sees Blair preoccupied and sneaks in towards Marcus for the kill. Uh, the killing of any hostility that is. Our Chuck Bass-tard befriends the Lord, and even scores a date with him. A squash date. Back to S and D, we find my least favorite couple trying, and failing, to keep their hands off each other. They even manage to join the 60 miles per hour club in a bus. And, I only realized how cute Dan is when he is not speaking. Nate on the other hand is still having some trouble with his parents. We find out that his mom is trying to keep him from going back to the city because his home is being searched. During a call we find out that Catherine, Nate’s clandestine married lover, is actually a duchess. Marcus’ duchess stepmother to be exact. She is also the main reason why Marcus doesn’t want Blair to meet his royal family. Lord Marcus is afraid that his wicked stepmother might scare his precious Blair away. Of course, Blair doesn’t know this, so she creates an impromptu party to get Marcus to spend more time with her. And impress him with her ability to throw a royal party. A little scene with Rufus and Vanessa tells us that Rufus is getting a kick out of being a semi-rockstar and isn’t sure whether he is done touring. Vanessa assures him that she’ll be sticking around to help out his kids however she can. And, isn’t Vanessa just the sanest person ever in Gossip Girl land? Nate is wandering around like lost little puppy because police people are raiding his home, and he’s got no one to talk to. Aw, Chace Crawford is so cute in this episode. During their squash date, Chuck subtly interrogates Marcus about his stepmom, and finds out about Blair’s Hudson party. Meanwhile, Blair and her sidekicks Dorota and Serena plan her impromptu Hudson party, and makes sure that her guest list is up to par with royal standards, which unfortunately, does not include most of her high school friends. Shockingly however, it does include Humpty Dumpty. 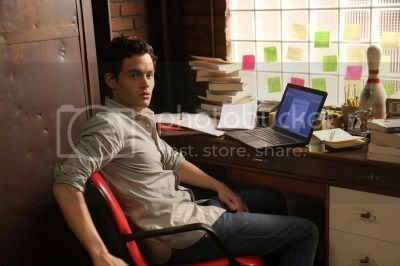 Uhm, I meant Dan Humphrey. Puppy Nate goes to Chuck for some bestie time, but Chuck is too busy selling his Burlesque club. He says it’s a good way to impress Blair, but we find out later that it’s actually a loan for Nate’s mom. Speaking of, Nate’s mom has some huge hellhounds with her, seriously where did those beasts/dogs come from? Meanwhile D and S has some more “we should think first but I want to see you anyway” drama. Vanessa tries to comfort Nate. And she does so quite well. Nate promises to see her later, because he found out from a call from his mom that a certain “he” is loaning their family some money for their financial trouble. Again, Chace Crawford is so cute in this scene. Meanwhile Chuck calls for a meeting with the duchess Catherine herself and discusses, I’m guessing here, the coolness of limos? That’s the only thing they have in common after all, right? Over at Hudson, everything is lame because we all know that Mozart is never a good choice for party music. Chuck shows up with wicked stepmom duchess Catherine, and Blair introduces herself with a capital B, as in Beeyatch. After realizing the error of her ways, Blair decides to apologize with some coaxing from Serena, this of course, makes no difference to Catherine because there is no way that her precious Marcus will ever be with a lowly Waldorf. But don’t worry, she immediately changes her mind when Nate arrives for the party and Blair catches them together in the library. Oh My Effing God indeed. Nate also tells Chuck off for trying to help his family because Chuck lied to his face. Uhm, okay. Eventually, Nate finally gets to talk to someone about his family's financial problems. Catherine. Catherine, being a callow-former-swimsuit-model-enslaved-by-her-own-insecurities who has some compassion (all according to Blair), offered Nate some help. Dan comes home with Little J in tow and they find their semi-rockstar Dad, Rufus, cooking up some family dinner time. Still not sure whether he will go back to touring, or stay home, though there are some hints pointing to the latter. This is Gossip Girl land after all, who knows what that sentimental reminiscing Rufus did could actually mean? Over at the Van Der Woodsen/Bass home, Blair is staying over for some bestie time, and seems to enjoy her after battle flirt with Chuck. And, how sweet is their little goodnight to each other? Over at Vanessa's place, we see that she has set up a romantic Chinese take out for two, but her guest Nate is away in a limo making a deal with the wicked duchess. Anyway, overall pretty interesting episode, there were a bit more twists than last week. I kinda miss their high school setting, hopefully we’ll get more of that next week. And, I’m increasingly disliking the Dan and Serena tandem. I hope the writers find something more interesting for them to do than just the drama of breaking up and getting back together routine. Oh my gosh. I have to watch this! What site do you visit to watch this? hahaha. i'm curious. I love this show so damn much!!! Nice recap indeed. Great blog. Very well said!! Haha! I can't help but wait homegirl !! :)) you're the BOMB!